In this article we are going to share the important concepts related to Isomerism including some solved questions for coming entrance exams like JEE, UPSEE/UPTU, WBJEE, SRMJEEE, VITEEE etc. It will also help students who are preparing for CBSE class 11 exam. Isomerism is a very important part in the syllabus of Chemistry for engineering entrance exam and CBSE class 11 exams. In this article we are going to share the important concepts related to Isomerism including some solved questions for coming entrance exams like JEE, UPSEE/UPTU, WBJEE, SRMJEEE, VITEEE etc. Isomerism mainly comes in CBSE class 11th chemistry syllabus and becomes the major parts in engineering entrance examinations like JEE Main, WBJEE, UPSEE, VITEEE etc. Following are the chapters of NCERT book where isomerism is being taught. In JEE and other engineering entrance examinations, every year 3 to 5 questions have been asked. So, this topic is very important for both the examinations. 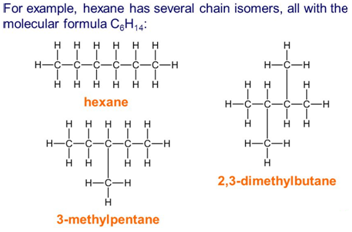 The phenomenon is termed as chain isomerism when two or more compounds have the same molecular formula but differ in the branching of carbon atoms. The isomerism in which two or more compounds have identical molecular formula but differ in the functional group present is called functional isomerism and these isomers are called functional isomers. Stereoisomerism is a phenomenon in which compounds have the same molecular formula but differ in the relative positioning or orientation of atoms in space. It is two type. This is being exhibited by molecules in which their special positions are locked to each other due to the presence of a ring structure or a double bond. The isomerism exhibited by two or more compounds which have the same molecular arrangement but differ in the optical activity.